I purchased the front end panel with the headlight braces from a gentleman off ebay. He advertised it as fitting my 63 and at the time I did not notice that it was a 1960 specific part as they changed the front end for 61-64. I am taking offers and the item is located in Dayton Ohio as it is pretty large to ship. New owner of a 63 Monza 4 door project car. Edited 1 time(s). Last edit at 10/10/2012 08:44AM by MattNall. Sad you have to resell it because I sent the seller a message when it was first on eBay advising him it was only correct for a 1960 model and that he was going to confuse people who wanted one to fit other years from 61-64. He never replied back. The one I have is the one with the headlight braces, the one on the left. Home of the "Red Desert Corvair Sanctuary." half a dozen parts cars n trucks or more. 20x40 garage full of greasy parts. Thats the early 60 panel, whats your best price? It was listed on ebay for $450.00 but I offered him $350.00 and he brought it to the Springfield Swap Meet. I would take $300.00 if you can pick it up. I see the differences between the two panels but am unaware of which one is early design versus later 60. Can you enlighten me (us) so that we can carry this information forward? 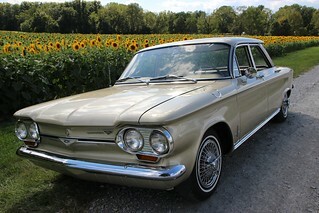 As well, this should be brought to the attention of Jim Diell, author of the 1960 Corvair book. > author of the 1960 Corvair book. The early 60 fender is filled in behind the headlight pot, the later design fender is open behind the outer headlight. clear as mud , EH? When you get it Marv, cut some horn slots in it. Do you still have the 60 nose pieces? Really need one!